If you have any apples that we could col­lect to juice please con­tact Diana as soon as pos­sible. Many thanks – we hope to see you there. 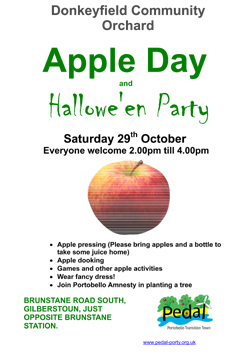 Donkeyfield Community Orchard is at Brunstane Road South, Gilberstoun, just oppos­ite Brunstane sta­tion. Poster for Apple Day 2011 to down­load and print out. This entry was posted in events, Food, gardening, Orchards and tagged apple day. Bookmark the permalink.